In part one of our blog, Key Considerations for an Azure Deployment, Corey Roberts, Daymark’s Director of Managed and Cloud Services, addressed some of the common questions clients have regarding migrating workloads to Azure. Now he moves on to talk about benefits, application performance, and how to best prepare for an Azure deployment. Q. Why Azure over other public clouds such as AWS or Google Cloud? A. It’s been my experience that Microsoft has built a cloud platform with Azure that the majority of IT organizations can embrace quickly and easily with a shorter learning curve. The offering is extremely robust and new features are regularly added. Google is growing quickly, but is still behind in terms of features and toolsets. Amazon Web Services (AWS) is the public cloud market share leader, however, my experience is that their platform is significantly more complex and involves a much longer and steeper learning curve. AWS is flexible, but the AWS concepts, language and terminology can be challenging. Azure has the traditional Microsoft look and feel. If the client’s staff is comfortable with Windows Server, adopting Azure will be intuitive. Q. Are there noticeable differences in Azure adoption based on vertical industry or company size? A. Adoption is happening across the board in almost every industry. Each customer has their own unique requirements and different priorities and justification for moving to Azure, but the decision-making justifications are all fairly similar. Q. What are the first benefits customers realize? A. 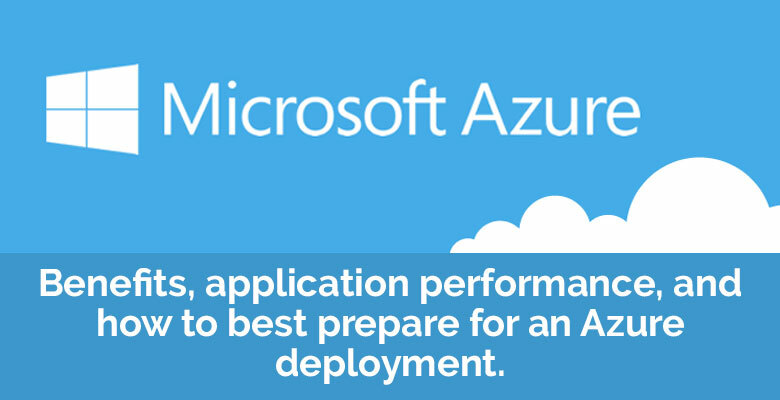 Almost immediately, customers are impressed with Azure’s agility when deploying resources. One Daymark customer recently deployed a new production web app in Azure. They had had many starts and stops trying to build this with existing infrastructure. With Azure, they quickly went live with the application and had the flexibility to shift their design multiple times and even swap out several components like load balancers and firewalls, all while avoiding lock-in to any specific vendor. Q. What should customers expect in terms of application performance? A. Performance is based on the level of resources purchased for the workload. Customers must balance monthly cost with performance. The more resources deployed, the higher the monthly cost. Lower resource utilization will bring down costs, but a smaller monthly investment in compute and storage may result in performance slowdowns. It’s a balance that each customer needs to find. The good news is that customers can adjust resources manually or based on pre-defined thresholds to increase or decrease performance and or cost – all based on demand. This provides the best of both worlds with costs decreasing during lower demand and increasing only when additional resources are required. Q. What should companies do to prepare for Azure? A. Customers should do a few things as they begin to move workloads into Azure. First they should consider training for the individuals that will be working with the platform. Second they should spend time with a Microsoft Partner like Daymark to learn about Azure and understand the best approach for their particular requirements. Daymark can help accelerate the implementation and ensure Azure best practices from the start. Third it is important to have a separate tenant available for a lab environment where IT can explore all the features without the risk of impacting production workloads. Q. What’s the role of Professional Services in an Azure migration? A. Daymark Professional Services can help customers prioritize their goals, architect a solution, and implement the right workloads in Azure. Daymark often provides workshops, training and Proof of Concepts (POC) to ensure the customer is competent and confident with relying on Azure. Our consultants work side-by-side with our customers to provide knowledge transfer, best practices and guidance every step of the way. Q. What should companies look for in a Managed Services Provider? A. When evaluating managed service providers, businesses should look closely at the people that will be delivering the services. Daymark has a seasoned team of individuals with an average of 12 years of enterprise IT experience and managed services delivery. We are committed to continuous training and technical certifications across a wide range of technologies. Our success is the result of that experience and broad range of IT skills. We also spend time to build relationships with our customer’s staff and work collaboratively with them to ensure success. Most of our clients consider us an extension of their internal team and we feel the same! Contact us if you’d like to learn more.